Scot Miller has published seven books featuring his photography. His books grace many bookshelves and coffee tables. 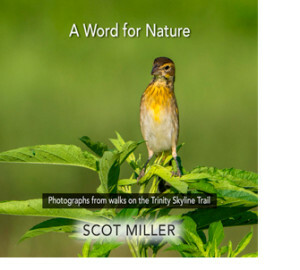 A Word for Nature: Photographs from walks on the Trinity Skyline Trail features photographs I took on sixty-five walks with my wife, Marilyn, and dog, Bart, on the Trinity Skyline Trail in Dallas, Texas, from April to August, 2017. At least one photograph from each walk is included in the book. A total of 129 photographs highlight the natural beauty of this special area. In an introduction, I lay out a case for embracing and creating a long-term plan for caring for nature in Dallas’s Trinity River greenbelt and Great Trinity Forest, advocating for a new structure for managing the natural resources of the river and forest. There is also a short statement at the end of the book. Other than that, the photographs do the talking. They are presented in calendar order with no accompanying text other than dates. Individually, the photographs are engaging but collectively they make a powerful statement. Marilyn and I hope this book, and the video, will become powerful tools of education and advocacy in relation to the future of the entirety of the Trinity River greenbelt and the Great Trinity Forest, and would like to get it in the hands of as many people as possible. I want to make it clear that I see benefits for well-conceived and executed parks, including the Simmons Park, planned for 200 acres, but am frustrated with the lack of a serious, comprehensive plan for protecting and preserving our 10,000 acres of wild spaces in Dallas. Where are plans to preserve our river, streams, meadows, forests, wetlands, flora and fauna? We are at a crossroads and have an opportunity to create something unique to the country, and the world. It’s time to think outside the box and create a new paradigm to preserve, protect and manage the ten thousand acres of “wild” nature along the Trinity River and in the Great Trinity Forest. A grand plan is in order. Proper management and oversight is an absolute necessity. Working together, we can make it happen. The book dramatically commingles words and images and is designed to inspire and ignite readers much as the larger literary canons of these three men have. The photography section follows the Introduction, with at least one quotation paired with each image but in many cases, numerous quotations. The photographs were created from October 1997 to October 2014, each conveying the spirit of a particular moment (some longer than others), a feeling, or a sense of place. Seventy percent were created in national or state parks/forests across the country. Following this, all three essays (plus Muir’s touching retelling in his “The Forests of Yosemite Park” of meeting Emerson in Yosemite) will be reprinted, thus providing readers with the full context surrounding the quoted passages. Levenger Press, the publisher, is offering the book as a special Collector’s Edition. The book features high production values in terms of paper, color treatment and binding. In keeping with the American spirit of its subject matter, the book was printed in America, and by an environmentally responsible printer. Both Yosemite Conservancy and the Walden Woods Project are featured in the back matter, with a descriptive paragraph on each of these two nonprofits. 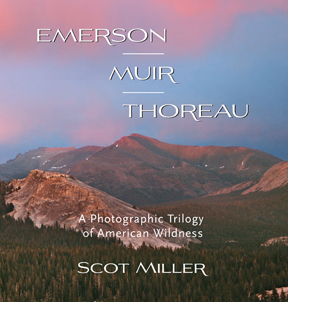 Emerson, Muir, Thoreau: A Photographic Trilogy of American Wildness is a memorable prelude to observing the one-hundredth anniversary of the National Park Service in 2016. The Maine Woods is very much an adventure book for nature lovers. It’s also a book that reminds us of the value of conservation and preservation. It’s still possible to see much of what Thoreau sees in his Maine Woods journeys today. The photographs in this Levenger Press Collector’s Edition offer a lens for witnessing much of what Thoreau did…even if you have never been to Maine. 2011 National Outdoor Book Awards Winner! 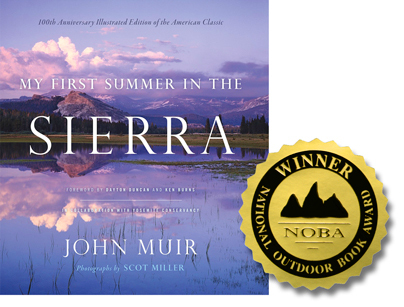 Scot Miller takes on the seminal work of John Muir, My First Summer in the Sierra. The book details Muir’s first extended trip to the Sierra Nevada in what is now Yosemite National Park, a landscape that entranced him immediately and had a profound effect on his life. The towering waterfalls, natural rock formations, and abundant plant and animal life helped Muir develop his views of the natural world, views that would eventually lead him to push for the creation of the national parks. Timed to coincide with the 100th anniversary of the book’s original publication, and published in collaboration with Yosemite Conservancy, My First Summer in the Sierra: 100th Anniversary Illustrated Edition features seventy-two of Miller’s stunning photos, showcasing the dramatic landscape of the high Sierra. Twenty-one illustrations by John Muir that were in the original edition are also included in the book. The book contains five photographs taken by Scot of John Muir’s hand-written journal pages, including several Muir illustrations that have never been published before. The publication of My First Summer in the Sierra inspired thousands to journey there, and this illustrated anniversary edition will surely inspire thousands more. Ansel Adams led regular trips into the Yosemite backcountry as part of his efforts to protect this rare instance of untouched nature and, as a result, introduced thousands to its beauty. Following his example, Yosemite Conservancy asked five well-known Yosemite photographers to once again bring the wonders of the wilderness to the general public. 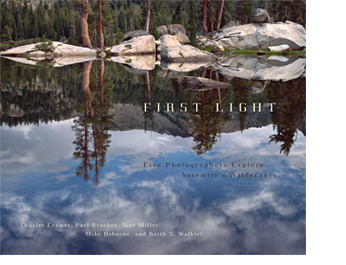 For five years, these five photographers spent a part of their summers in Yosemite’s wilderness region, which covers more than one thousand square miles of almost indescribable raw beauty, and the camaraderie that developed between them is evident in the reminiscences and musings that accompany their photographs. The result of this uncommon collaboration is a book of glorious prints, each imbued with its creator’s distinct style. Originally published in 1865 by Houghton and Mifflin’s predecessor, Ticknor and Fields, Henry David Thoreau’s Cape Cod is a wonderfully written, surprisingly funny account of 19th century life on the Cape, well before it became a major tourist attraction. To this day, many people consider it to be the best book ever been written about Cape Cod. This new illustrated edition features the complete 1906 Houghton Mifflin edition text of Thoreau’s classic work, the stunning photography of Scot Miller, and a foreword from preeminent Thoreau biographer Robert Richardson. For his book, Thoreau spent about three weeks in Cape Cod on three trips over a six-year period. Scot Miller spent about six weeks on seven trips over a sixteen-month period. Thoreau observed and wrote about the landscape, seascape and culture. Scot observed and photographed the same of today. Many of the lush color photographs have a timeless quality and show things Thoreau could easily have seen: the Great Beach, imposing cliffs, sand dunes, beautiful sunrises and sunsets, beach grass, seaweed; others reflect the unique personality of Cape Cod and its people today: from local artists to architecture. 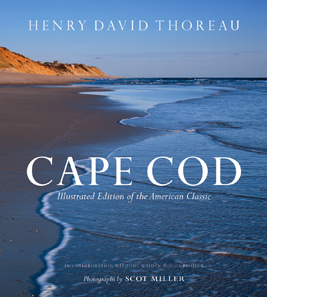 The combination of Thoreau’s timeless text and Scot’s exquisitely reproduced color photographs make this an indispensable addition for anyone who loves Thoreau’s writing and the perfect book for anyone who loves Cape Cod or photography. The book is published in association with the Walden Woods Project, which is dedicated to preserving the lands Thoreau wrote about. For each copy sold, Houghton Mifflin and Scot Miller are making a donation to the Walden Woods Project. Updated in 2015 with a new Introduction by Don Henley, founder of the Walden Woods Project. August 9, 2004, marked the 150th anniversary of the original publication of Henry David Thoreau’s Walden, one of the most widely read and influential books ever published. 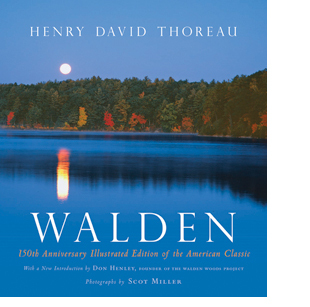 In celebration of this historic occasion, Houghton Mifflin published a special anniversary edition of the classic work, in cooperation with the Walden Woods Project, the nonprofit organization founded by recording artist Don Henley in 1990 to protect the land and waters celebrated in Thoreau’s writing. Two-time Pulitzer Prize-winner E.O. Wilson contributes a thoughtful Foreword. Adding to the inspiration in this edition are the eighty-nine stunning color photographs by Scot Miller; Scot’s images capture Walden as vividly as Thoreau’s words do. The book also features four historical black-and-white photographs by Herbert Wendell Gleason, who photographed Walden Pond and the Walden Woods area in the late 1800s and early 1900s, and a map of the pond. 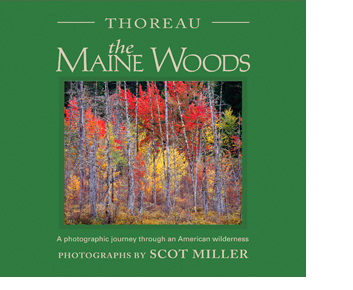 Houghton Mifflin and photographer Scot Miller are donating a portion of the proceeds from the sale of each book to the Walden Woods Project.